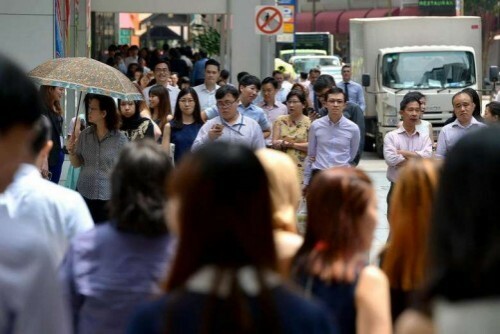 Singapore's job crunch: Time to learn new skills and update that CV? When Ministry of Manpower (MOM) figures earlier this month showed the number of job openings in Singapore had fallen below the number of job seekers for the first time in four years, workers like Bernadette Lee were taken aback. "I was shocked," said the 56-year- old. "It's not good news. It's been a long time since I've heard something like this." She left her job as a social worker last month to seek a better work-life balance, but worries now that her job hunt might be more difficult than she had expected. "I have to lower my expectations. I was a manager but now I may have to settle for an executive position," she said. Casting a shadow over the labour market in recent months were economic indicators reflecting the slowing economy. One of the most recent was the MOM's figures showing that unemployment among citizens and permanent residents rose to 3 per cent in the second quarter of the year, from 2.7 per cent in the previous quarter. These rates, which are adjusted for seasonal factors such as Chinese New Year and school holidays, have not gone above 3 per cent since 2010. Layoffs also reached a seven-year peak. The number of workers who were retrenched or had their contracts aborted in the first half of the year hit its highest level since the global financial crisis in 2009. Furthermore, the rate of workers re-entering employment has plummeted to its lowest since then. Job growth has slowed and, for the first time in four years, job seekers outnumber job vacancies, which have been falling since last year. Manpower Minister Lim Swee Say said at a career fair last Friday he hopes this is not so much a downward trend as a hump in the road that Singapore has to push itself over, to get to the greener pastures of productivity-driven growth. He said: "As we go through this transition, there will be disruptions, there will be retrenchments, there will be downsizing in some sectors." Creating more jobs is only part of the solution, he added. "If we are not careful, unemployment might go up, not because we don't have enough jobs but because there is a mismatch between jobs and skills. Then we would have structural unemployment, which is harder to solve." But it is not all doom and gloom. The Government, businesses, job hunters and even those who are still in employment are being pro-active in finding strategies to help them work things out in the changing work environment, as the stories in this package show. With the global economy never truly recovering from the 2009 crisis, growth has been patchy in export hub Singapore. And now, recent global developments have turned up the heat. National University of Singapore associate professor of economics Liu Haoming said: "Given the uncertainty introduced by the United States election, Britain's exit from the European Union and the slowdown in the Chinese economy, firms will be very cautious about their hiring." He added: "Whether this trend will continue into the next year will depend on what happens in the rest of the world, particularly in the US and China. "If (US Democratic Party candidate Hillary) Clinton wins the election, it will likely increase people's confidence about the US economy, which should have a positive impact on Singapore's economy." Global economic headwinds aside, the nationwide productivity drive has required companies to restructure which, in turn, has forced them to shed jobs. Ms Linda Teo, country manager of recruitment company ManpowerGroup Singapore, said the rise in redundancies, especially in the labour-intensive services sector, has been exacerbated by the slowing economy and softening consumer demand. "Companies are either operating on leaner headcounts to contain costs or have replaced certain functions with technology," she added. A total of 9,510 workers were made redundant in the first half of this year, compared with 6,750 in the same period last year. The MOM was concerned enough to bring forward to this year a retrenchment survey due next year. The survey, which takes place every four years, will widen its scope to cover smaller firms employing between 10 and 24 workers. But what is setting alarm bells ringing now could very well be Singapore's new normal, said SIM University labour economist Walter Theseira. "There may be no quick rebound as there was from the 2009 global financial crisis," he said. "We are entering what is likely to be a prolonged period of low to moderate growth - a situation that Singapore has never experienced before, but which is normal for most developed economies." Economist Selena Ling from OCBC Bank said the unemployment rate could hover above 3 per cent for the next two years or so. Should firms still be pushed to restructure amid such uncertainty? "When it comes to economic restructuring, there is never a good time," said Ms Ling. "If you do it when times are good, you'll have businesses asking why you're changing things while everything is going well. When times are bad, see it as a chance to put your house in order while things are quiet. The competition is always nipping at your heels." In fact, an unemployment rate of 3 per cent would be considered something to cheer about for almost any other developed country. Dr Theseira said that while things might look dire compared to what Singaporeans are used to, the country is - relatively speaking - not that badly off. "Many advanced economies would love to have our present unemployment rates, which would be considered to be unusually low by their standards." Economists and labour MPs alike said it is too soon to characterise the labour market as slackening. Prof Liu said: "The decline in employment and job openings happened only in the second quarter. After four quarters of almost continuous growth in employment across all industries, it is still too early to say the tight labour market is over." National Trades Union Congress (NTUC) assistant secretary-general Patrick Tay cited numbers to show there are jobs available, but a mismatch of skills has prevented them from being filled. "For example, we hear there are more than 15,000 vacancies in the tech and IT sector. But the problem is, do we have enough experienced persons available... to fill those jobs?" The Government has been rolling out scheme after scheme to tackle this mismatch, from a new virtual career fair in the last two weeks to better connect employers and job seekers online, to plans to transform entire industries. Last Friday, MOM's Mr Lim launched two new career programmes for the hotel sector, which employs 35,000 people. One is a new skills framework under the nationwide SkillsFuture initiative. It is a structured guide to help workers chart their career progression and identify specific skills to get jobs they want. The other is the Professional Conversion Programme (PCP) for Professional Executives, to ease the transition for mid-career professionals between multiple industries. It starts for the hotel industry next month. NTUC's Mr Tay, who chairs the Government Parliamentary Committee for Manpower, said the lower birth rates of the past two decades meant there will be fewer new entrants to the workforce, as the baby boomer generation go into retirement. This will keep the labour market tight. But this is scant consolation for workers who are used to almost full employment but must now worry about their rice bowl. From a young age, Singaporeans are told to study hard and earn tertiary qualifications to get a good, white-collar job which they can keep until retirement. But good qualifications are no longer a guarantee of employment in a world disrupted by technological change. Speaking to global business and political leaders at the Singapore Summit recently, Deputy Prime Minister Tharman Shanmugaratnam called for students to be put on "paths of advancement" for skills in dealing with real-world situations. "The whole mantra of college education - of trying to make it as easy as possible for everyone to get a college education - is a big mistake," he said. Indeed, as to what opportunities are emerging on the job landscape, some areas workers should look at are compliance and financial technology, said Mr Foo See Yang, vice- president and country manager for recruitment company Kelly Services Singapore. He said another paradigm shift arising from the economic situation is a growing interest in contract and freelance work. From 2011 to last year, Kelly saw a 70 per cent increase in placements of high-end contract jobs with monthly salaries of more than $10,000. "Contract work can be a long-term career option with similar remuneration rewards as full-time employment," he said. Offering advice for workers, ManpowerGroup's Ms Teo said: "In today's ever-changing job environment, career longevity, and not job security, is more crucial. The reality of today's work environment is that no one is irreplaceable."